New Games on Demand were released 9/7/10. (Online Interactions Not Rated by the ESRB) This game supports English, Spanish, and French. Download the manual for this game by locating the game on http://marketplace.xbox.com and selecting “See Game Manual”. 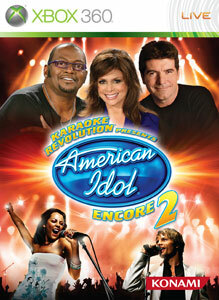 Live out your dream as a singing sensation with Karaoke Revolution® Presents: American Idol® Encore 2! Play with friends and family online using the brand new co-op head-to-head mode, or compete in front of all three American Idol judges and sing your way to stardom. Customize your game experience with all-new enhanced characters and features and downloadable songs. Are you ready to be the next American Idol? There are no refunds for this item. For more information, see www.xbox.com/live/accounts.